Radius Books, 2010. 96 pp., 47 color illustrations, 10x13". 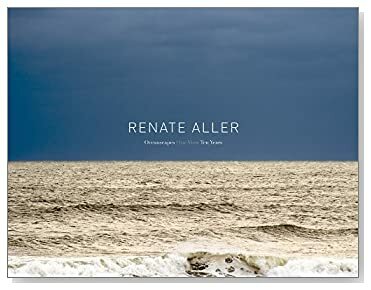 German-born photographer Renate Aller has been photographing the Atlantic Ocean for over a decade from a single point on the fabled Hamptons’ coastline. Her images capture the infinitely shifting colors and textures of the sky and water, and the beauty and grandeur of the ocean, providing a rich document of what has drawn people to this area for generations. The sublime beauty of this view, which Aller directly connects to the great 19th century German Romantic painter Caspar David Friedrich, is also a metaphor for the landscape of the human emotions. Aller’s viewpoint is static, but the changing weather and light allow for a diverse series of images that open up a vast ‘visual library’ of memories and associations. Printed in Germany, the book captures the subtle mystery of her larger prints and the original oceanscapes. Co-edited with an essay by German art historian Jasmin Seck and contributions by Hamburger Kunsthalle Museum’s contemporary art curator Dr. Petra Roettig and New York critic Richard B. Woodward that place Aller’s work both in the context of landscape photography and the history of images of the East End’s southern shore. The limited edition includes a signed and numbered color archival pigment print mounted to Diasec with a book in a plexiglass box. Limited to 25 copies. Read about the limited edition and view photos on photo-eye Blog. Read Douglas Stockdale's review of Oceanscapes in photo-eye Magazine. This item is unavailable from photo-eye. DQ540-LTD Limited Edition is no longer available.